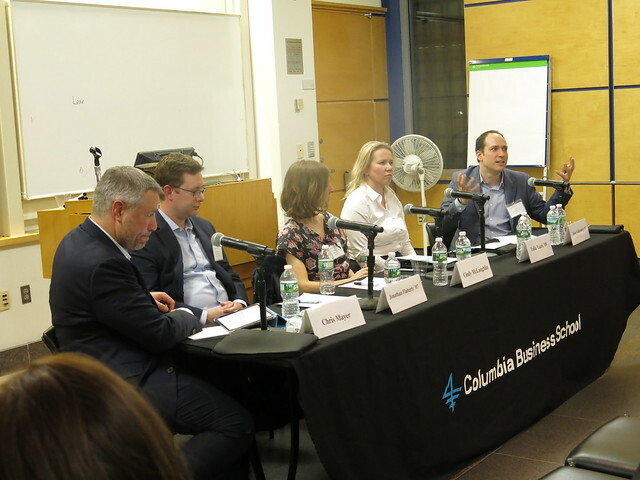 On Wednesday, February 28, 2018, the Real Estate Association and the Paul Milstein Center for Real Estate co-hosted the fourth annual Real Estate Technology and Entrepreneurship Panel. This dynamic panel was moderated by Professor Christopher Mayer, Co-Director, Paul Milstein Center for Real Estate, and featured distinguished alumni and speakers: Jonathan Flaherty’07, Senior Director of Sustainability and Utilities, Tishman Speyer, Ross Goldenberg ’07, Co-Founder and Co-CEO, SiteCompli, Cindy McLaughlin, CEO, Envelope, and Yulia Yaani, ’08, Founder and CEO, RealAtom. The conversation centered on some of the latest technologies in real estate compliance, development and transactions, and some of the challenges with implementing technology solutions. To kick off the discussion, panelists spoke about the pace of technological change in the industry. Ross Goldenberg shared his experience entering the real estate industry as an outsider when he first launched SiteCompli with fellow CBS alum, Jason Griffith ’06. In 2012, Ross and Jason noticed that a surprisingly large number of buildings still used a paper-based work order system to track tenant requests—a system that had been in place for decades without any drastic disruption. They immediately gauged the slow pace of innovation and technology absorption commonplace to the industry. All four panelists confirmed that this has also been their experience and change will require an entrepreneurial attitude within both startups and established companies. Jonathan Flaherty brought perspective to acting as an entrepreneur within a larger organization, and discussed how innovation takes shape at large industry incumbents. Through Jonathan’s experience at Tishman Speyer, he realized the limitations of common industry practice. Most building systems are set up independently, leading to inefficiencies and an incomplete picture of how to optimize building operations across a portfolio of properties. Jonathan recommended the idea of treating buildings systems as a single IT entity and pioneered their Building Technology department, which helps the company better understand how to coordinate technology solutions internally, and to look outward for new solutions offered by startups. Jonathan noted that many owner and operators are now taking a stake in those startups whose products they have signed up to use. Jonathan also shared that one of the biggest challenges is for the industry to reach consensus on how to define “best in class.” There are currently property technologies that excel within existing silos, but it is challenging to find a single technology solution that perform many functions well, or for which the opportunity cost of overhauling existing systems in place at the asset level is not prohibitive. Another pertinent question arose around the scaling business models in the startup real estate technology space – are products intended for a more localized or broader user base? Envelope, which helps clients to understand zoning-constrained building massing scenarios, uses technology to make knowledge more accessible and remove the inefficiencies of the currently opaque process. Cindy McLaughlin noted that developing a tool with deep automation of the New York process became their edge, similarly to SiteCompli, which has focused strictly on New York area given the complex differences in regulations across cities. In contrast, Yulia Yaani’s experience at RealAtom has been to appeal to a national market. Unlike the general technology space where more global market concepts can be applied, real estate requires deep market understanding, which affects the business model real estate startups choose to pursue. The panel also discussed the skills and backgrounds that best position aspiring entrepreneurs to succeed in their ventures. Cindy shared that her experience running tech teams for other companies has proven to be advantageous when navigating the real estate industry. It has allowed her to spot addressable challenges that people immersed in the industry consider standard procedures. Cindy’s experience as a “professional start-up builder” allowed her to identify key connections early on while collecting user feedback to enable the product team to constantly improve Envelope. Ms. Yaani concurred by sharing that this was her third startup (she encouraged the audience to “take the plunge”) and that she combined her previous professional and start up experience with the resources available at Columbia during her MBA. Ms. Yaani said that joining the 500 Startups accelerator helped her identify blind spots as well as best practices that she has adopted at RealAtom. The panel concluded with an active Q&A from the audience of students and alumni, covering topics such as information security, women in the industry, and the panelists’ thoughts on which technology trends—crowdfunding, blockchain, etc.—will gain a lasting foothold in real estate. The closing sentiment was that the real estate industry will see extreme technology disruption within the next twenty years. However, the disruption will not take place in a vacuum. The success of startups and incumbent real estate companies will come from close collaboration between technology experts and industry insiders to ensure that emerging technologies can be successfully developed and implemented. Sofia Zamora ’18 is a second year MBA candidate focused on Real Estate and Finance. Prior to business school she worked for five years as a structural engineer and project manager for private and public building restorations in MA. She is passionate about mentorship and studying the overlap of technology, entrepreneurship and real estate. She will be joining Hines this summer at their Los Angeles office. Hayley Cox ’19 is a California Bay Area native and a first-year student at Columbia Business School. Prior to CBS, Hayley spent four years working for a private consulting firm focused in real estate development and urban and environmental planning, with clients ranging from cities and other local agencies to private real estate developers and REITs. Hayley has also been an active member of the Urban Land Institute, serving on two committees in the San Francisco District. Hayley is interested in real estate development and investment, and in the intersection of real estate, hospitality and technology.